Happy Labor Day weekend from a proud union member. 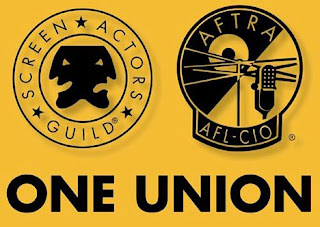 I belong to SAG-AFTRA and I've got the card to prove it. For your amusement and entertainment (I hope), I assembled bits of film-related projects I've done in my pursuits of future employment plus some footage from a previous gig. Call it The Bobby Rivers Labor Day Weekend Blog Show. Let's kick it off with a short clip from last year. In a pilot for a possible PBS film review/interview show, Gene Seymour and I discuss a romantic comedy starring Chris Rock and Julie Delpy. She also wrote and directed 2 Days in Manhattan. The two stars play a New York City couple dealing with a visit from her loopy French relatives. A few years ago, when I was a few pounds thicker, I had an absolutely fabulous experience in the Atlanta area. That's where I co-hosted a pilot shoot for a possible movie-based travel and history show. It was a pleasure and privilege to work with that crew and, especially, the wonderful Widdi Turner. She was my co-host. We visited the house of the woman who wrote a best-selling novel that made pop culture history. The film adaptation made Hollywood history. 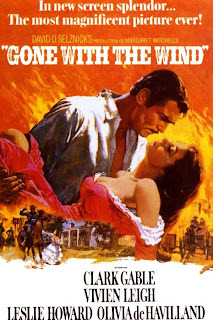 Margaret Mitchell wrote Gone With The Wind. We hit the road to Decatur, Georgia for some Irish cooking. This bar/restaurant was picked to be a location in a Tyler Perry movie starring Janet Jackson. The untimely death of her brother, Michael, changed the schedule. We got the story at The Marlay House. For a national cable TV show, I shot and wrote a short feature on Bessie Nelson. You may not know who she is but Beyoncé does. 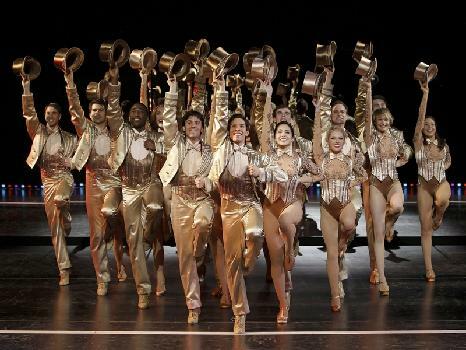 Cast members of A Chorus Line do too. To conclude, here's a DVD movie rental tip for this weekend. I was the entertainment editor on the ABC News/Lifetime TV show called Lifetime Live. I had the honor to work with the truly radiant Dana Reeve, wife of actor Christopher Reeve. She was one of the brightest lights that ever came into my life. And she loved talking about movies. I wish you an excellent Labor Day weekend. I hope you see me on TV again soon. Again I ask, "What the heck was in the Hollywood water of 1938 that made actors, writers and directors achieve maximum creativity while making films for release in 1939? The number of truly good movies released in 1939 was so plentiful that it's still a legendary year in Hollywood history. Back then, there were 10 nominees for Best Picture. There could have been 20. That's how good a year it was. Even the "B" movies had "A" qualities about them. I found an overlooked gem from 1939. 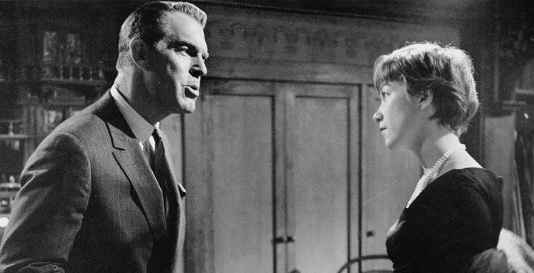 It's a romantic comedy from Paramount Pictures that stars Fred MacMurray. He was a handsome, under-rated actor who made Hollywood acting look easy. His "A" qualities are on display here. 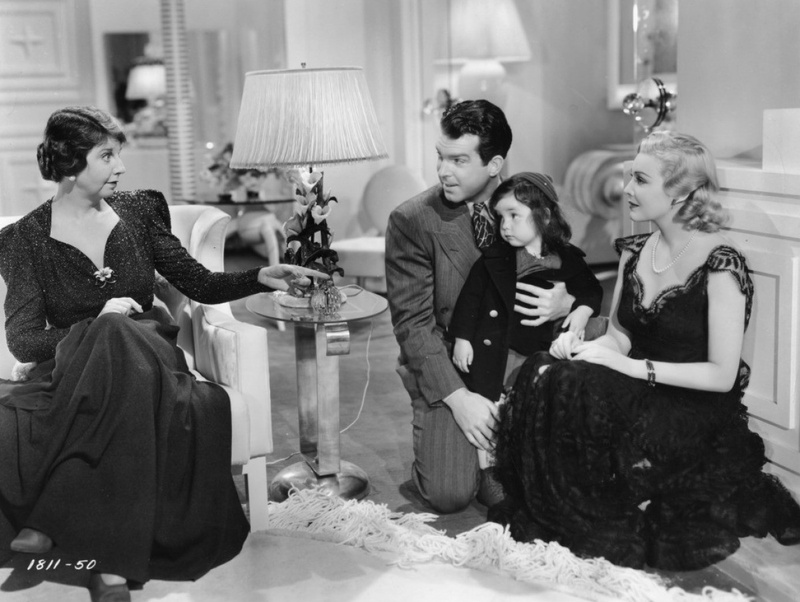 The comedy is one of those movies that fell into public domain -- like It's A Wonderful Life before baby boomer affection for the Capra holiday classic rescued it from limbo and enabled it to be restored, remastered and get annual network airings. 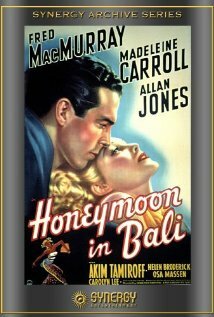 Apparently MacMurray's sweet comedy was originally titled Honeymoon in Bali. 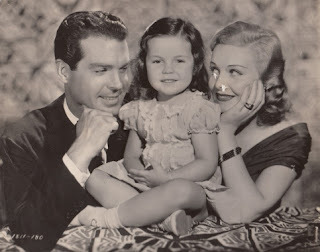 MacMurray's co-star is Madeleine Carroll, the lovely British actress who was one of the first Hitchcock Blondes. She starred in Hitchcock's 1935 thriller, The 39 Steps. The couple does visit Bali but most of their story takes place in mid-town Manhattan. Somewhere along the way, the movie title was changed to My Love For Yours. This is a pearly, polished comedy with a snappy pace and hip sophistication that makes it seem like one of better Mitchell Leisen comedies. Only he didn't direct it. Edward H. Griffith did. The warm-hearted screenplay is by Virginia Van Upp. If you're interested in "Women in Hollywood" history, she's someone to consider. She was a veteran screenwriter. She wrote one of Rita Hayworth's best musicals, Cover Girl, co-starring Gene Kelly. Then she produced the noir classic, Gilda. That film shot Rita Hayworth up to international Hollywood superstar status. Virginia Van Upp did that at a time when very few women were getting producer credits. In fact, she was one of the three. 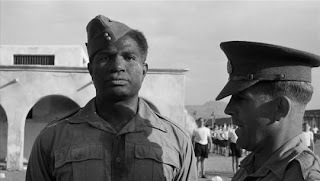 Freddy Mac is one of those Hollywood veterans who worked for decades in the movies but never got an Oscar nomination. His versatility seemed to be subliminal. 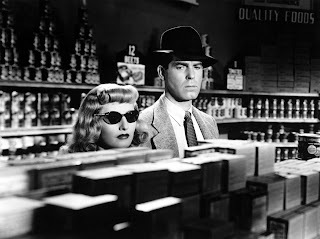 He could go from screwball comedies to being a cold-blooded killer -- most famously in Billy Wilder's Double Indemnity (1944). He did war movies like The Caine Mutiny (1954), musical comedies (he had a fine singing voice that was put to good use in Sing You Sinners (1938) with Bing Crosby and the 1945 WWII time-travel satire Where Do We Go From Here? ), he could be a corporate heel and cheating husband in Billy Wilder's The Apartment (Oscar winner, 1960 Best Picture) and then be the lovable, befuddled Disney lead/family man in comedies like The Shaggy Dog (1959), The Absent-Minded Professor (1961) and Son of Flubber (1963). 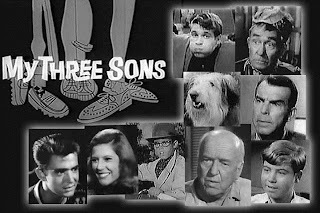 He was a top TV dad on the long-running hit sitcom, My Three Sons (1960-1972). From two heartless, horny characters in Billy Wilder classics to a sweet single parent in a classic sitcom -- not bad. Maybe MacMurray didn't achieve movie superstar status like a James Cagney, Humphrey Bogart or John Wayne, but he did some mighty fine work and was the leading man to Hollywood's top leading ladies -- Carole Lombard, Claudette Colbert, Barbara Stanwyck, Katharine Hepburn, Jean Arthur, Irene Dunne, Rosalind Russell, Marlene Dietrich, Paulette Goddard, Lana Turner, Ava Gardner, Lauren Bacall and Shirley MacLaine. Good chemistry with all of them. Madeleine Carroll was no exception. 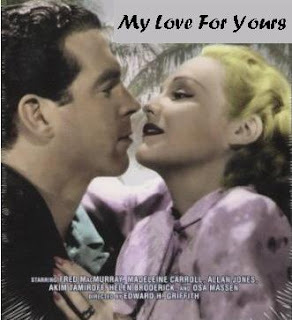 I found MY LOVE FOR YOURS (1939) on YouTube late last weekend night when I couldn't sleep. I figured I'd watch about 10 or 20 minutes then go to bed. I stayed up and watched the whole thing. In fact, I watched it again before the weekend was over. The movie was that charming, bright and well-played. I know it's an old movie. However, as a film reviewer, I've had to endure new romantic comedies from Katharine Heigl, Kate Hudson and Jennifer Aniston. Sitting through them was, indeed, work. It's not good sign when you're in a movie theater and, while the movie is playing, you wish you could press a fast-forward button to get to the end quicker. This vintage valentine is a winner. There's a "meet-cute." She's, Gail, an executive at a swanky Manhattan department store called Morrissey's. He's Bill, a sharp and smart big city bachelor who lives most of the year in Bali. He's crazy about the place. They meet on a boat. Indoors. In a store. Gail's determined to stay an independent career woman. She says, "I'm not a feminist, but the expression 'It's a man's world' always irritates me." She's not in the mood for love, she thinks. Gail also says "...love muddles you up...It throws you." Bill likes being a free spirit. And he's a kind man. He's a bachelor with a kid. His best friend is a widower, a single parent, a war vet and terminally ill. Bill has committed to caring for his little girl. Gail may have a fancy office and a top job but she's never lost a working class sensibility. She treats the window washer with the same respect she'd give to a fellow executive. We like Gail. We like Bill. They have substance. They're not just two privileged and pretty people who fall in love as if love is the birthright of the gorgeous. If you're a writer and/or actor, notice the opening scene with the burly and wise window washer played by Akim Tamiroff. There's no sense of higher position, in the executive sense, towards him. She never pulls rank on him. He notices her lovely legs while he's washing her windows in a rain storm. She tells him to come into her office and get out of the rain. He's doing his maintenance duty because it's company routine. She makes a call and reminds his supervisor that routine must never come before common sense. In her office, there's democracy -- like sitting in a Manhattan subway car. She and the window washer chat about store product. He comments on a dress and her shoes. Gail, the executive, considers his input. They become work buddies. If you were a young actress and were given that scene in sides (the script) to look over before the audition, that gives you information as to how to play Gail. She's democratic. Approachable. Concerned about others. Serious about her work. A smart businesswoman. The clues are all there in that light banter when you break down the script. Leading ladies in romantic comedies always have a trusty, less attractive gal pal. Gail's is played by Helen Broderick, the mature actress who played gal pal to Ginger Rogers in Top Hat and Swing Time. All the actors, the leads and supporting players, are on the same page. They know what the scene needs and how to move it along. 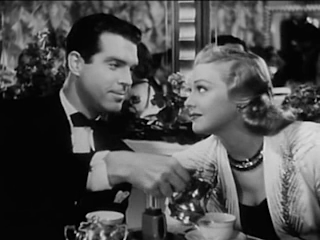 One key scene is wonderfully played by a supporting actress also known from an Astaire and Rogers RKO musical. Astrid Allwyn was in Follow the Fleet. She plays the fortune teller, a tarot card reader in a posh restaurant. She gives that small part such a nice champagne flavor. It's a nice scene with the three women. Allwyn shows you how to make a bit part stand out. It's smooth work. She's only in the film for about five minutes giving that beauty of a performance. The readings, of course, are for the amusement of the ladies who lunch. But the psychic predictions for Gail start coming true immediately. The first one comes true in the handsome form of Bill in a boat shop. That first scene with Fred MacMurray also works. 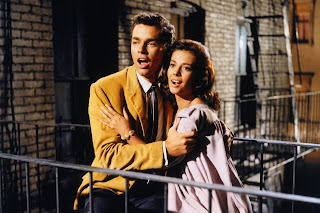 The way they toss the light romantic comedy dialogue back and forth, with such wit and flair, makes you say "THAT'S the way it supposed to be done!" in comparison to some rom-coms made today. What also makes My Love For Yours a real treat is Carolyn Lee as Rosie. She didn't become a famous child star like Shirley Temple or Margaret O'Brien. Yet she could steal a film and steal your heart. She's an unaffected, regular, polite little girl. And adorable. The three are terrific together. You want them to become a family. The movie is confident enough to inject a serious moment or two into the story. That gives it a nice depth. One scene that I loved -- Gail telling Rosie why we pray and to whom we pray. And how we pray. It's very delicate scene that shows us the career woman's spiritual quality. She teaches the little girl about The Lord. "...He's all around you," Gail says. She doesn't tell Rosie to pray for material goods and privileges. She tells her that prayers are for "...protection and love." Gail's got a gentleman that she dates in Manhattan. Bill's being chased by a shallow hot babe who seems to have very active hormones. She's a young widow. Her husband died and left her lots of money. She doesn't miss him. She wants to marry Bill. With her on the scene, you wonder if the tarot card predictions for Gail can come true. Trust me. This is a fun movie. 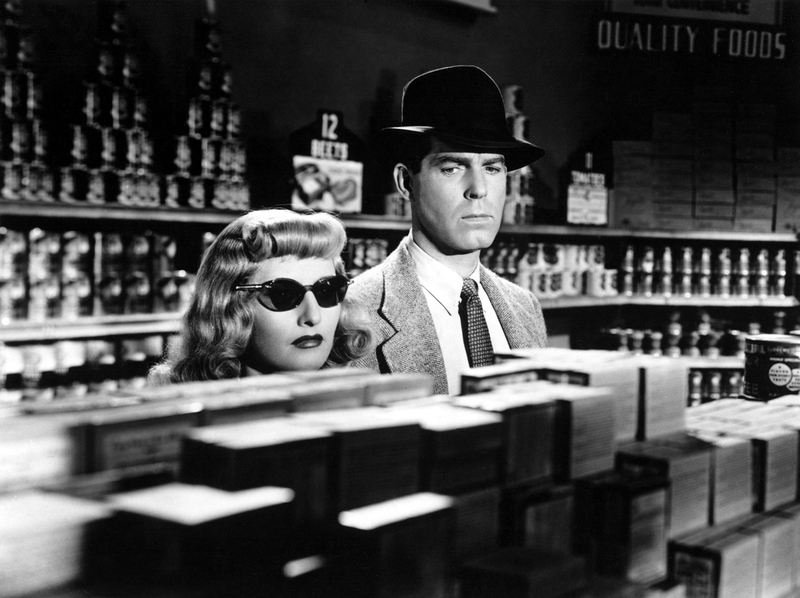 If you're a classic film fan, look for it online. I predict you'll be entertained. My Love For Yours also known as Honeymoon in Bali should be delivered from public domain limbo. Comedy is hard work. 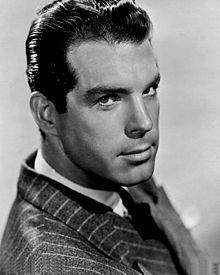 Fred MacMurray made it all look so easy -- for such a long time. For you fans of late night entertainment television and its history, you've got to hear Fresh Air this week on National Public Radio. 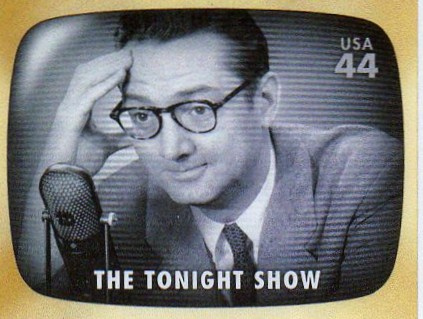 The whole week is devoted to the history of hosts in that competitive field of American television. Terry Gross is the NPR show's host. Television critic and historian, David Bianculli is a contributor. If you're a regular Fresh Air listener, you regularly hear Mr. Bianculli. For television, he is to TV critics and historians what Bruce Springsteen is to rock music. I totally dig David and have read his columns for quite a few years now. He is smart, insightful and informed. 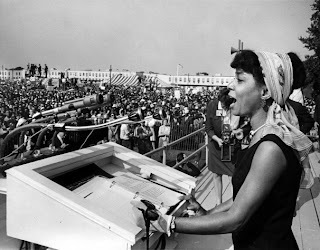 My following comments will be sort of a sequel to yesterday's blog about diversity after the 1963 March on Washington. 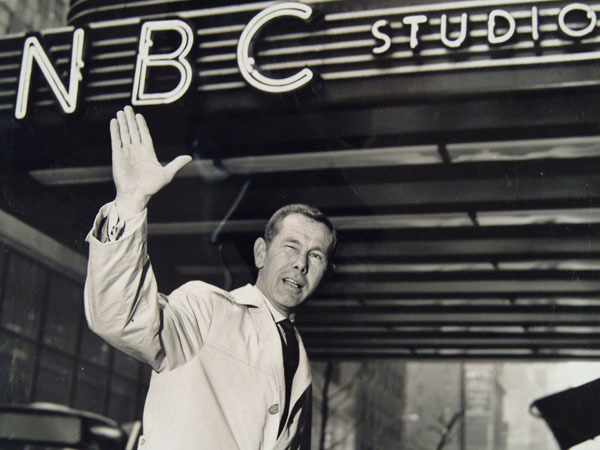 Monday kicked off with talk about the early days of brilliant late night hosts. 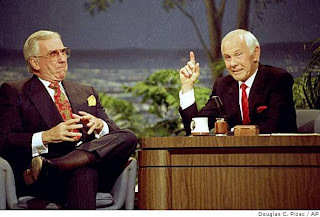 We heard about Steve Allen, Jack Paar and Johnny Carson. Great stuff. 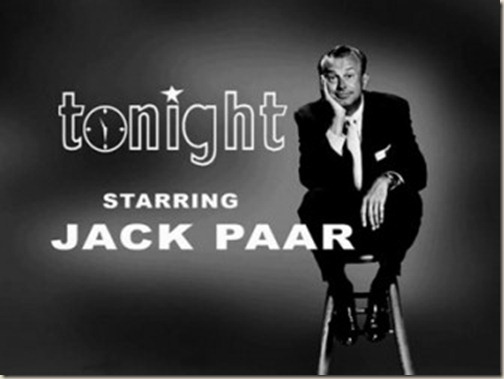 Steve Allen and Jack Paar especially had a major impact on me and greatly influenced my performance when I was a talk show host on VH1 in the late 1980s. I am absolutely positive that I was the only kid on my block in South Central Los Angeles who owned a paperback copy of Paar's autobiography, I Kid You Not. I loved him. Something interesting really hit me in the final minute or so of Monday's broadcast when Terry Gross and David Bianculli were wrapping up the show. 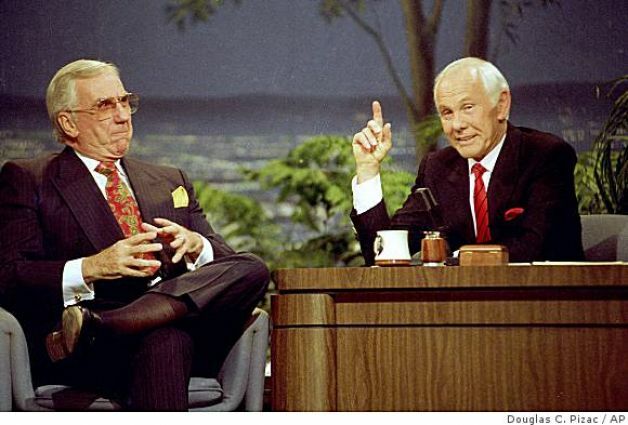 He mentioned a list of late night talk show hosts that went from legends Steve Allen, Jack Paar and Johnny Carson to less successful contenders like Pat Sajak, Chevy Chase and Joan Rivers. 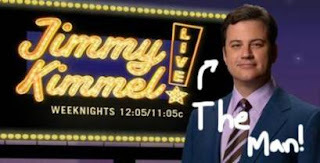 The Fresh Air series includes Jimmy Kimmel and Jimmy Fallon, stars of the new generation of late night hosts. You heard their names too. Not one single name David mentioned was a black performer. This is no reflection on David. It's just broadcast history that stands out to me. 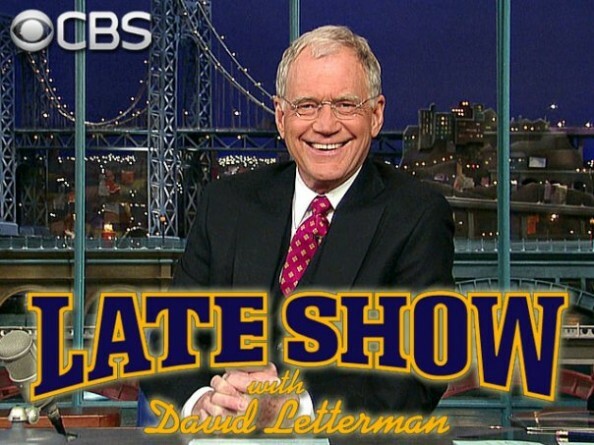 This series will cover half a century of late night TV hosting. 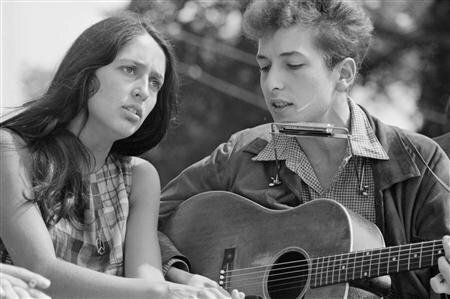 More than half a century. On Monday, it took us back to a good ten years before the 1963 March on Washington with the NBC arrival of Jerry Lester and Dagmar. Wow, does that TV field cry out for integration. I wonder if the Fresh Air "Late Night Week" will include the man who radically changed the whole post-prime time game -- Arsenio Hall. This bright late night star wasn't mentioned Monday, Tuesday or Wednesday. Hall made racial history with his syndicated hit from 1989 to 1994. Perhaps today's or tomorrow's show will give him some recognition. 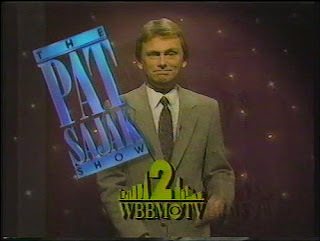 During my VH1 years, I was a semi-regular on CBS' The Pat Sajak Show. VH1 and CBS are under the same Viacom corporate umbrella. It was fun. I'd go on once a month and try to get Pat laughing. My appearances were pleasantly forgettable. 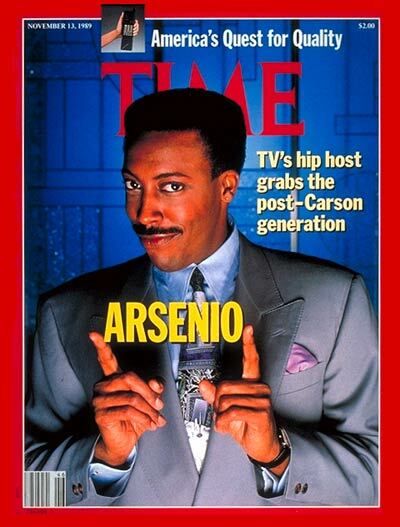 What I recall is that, prior to the show's premiere, upscale media seemed to feel that he'd be a King of Late Night. He got an 8-page major write-up in the magazine section of Sunday's New York Times prior to being launched at night. The Times paid little attention to the hip, talented black comedian/actor who was soon to skillfully and brilliantly bring the big MTV audience from afternoons into late night. He eclipsed The Pat Sajak Show which would be gone within a year. 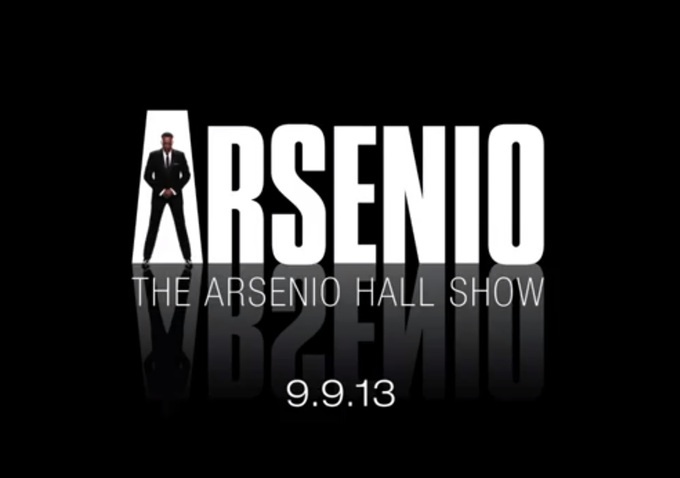 Arsenio Hall was competition for Tonight. 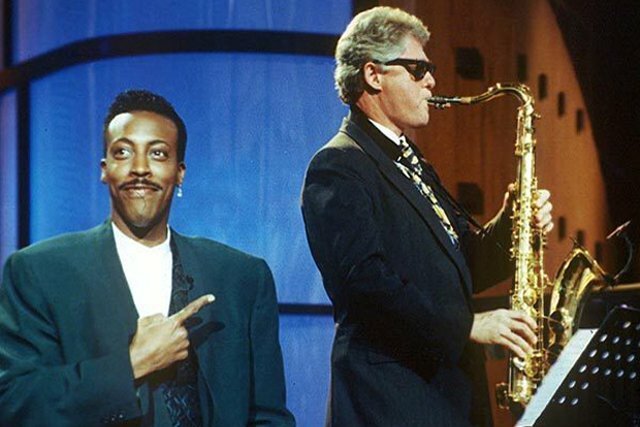 Remember Bill Clinton making a guest appearance playing the sax before he became President? Remember former NBA star, Magic Johnson, going on Arsenio's show to announce that he was HIV positive? The shows attracted huge audiences and generated major publicity. 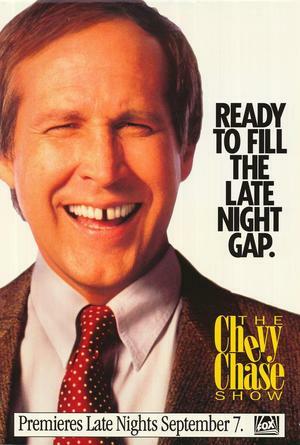 Hall whacked TV executives upside the head with a ratings skillet and made them realize that the late night TV audience included millions of minorities -- black, Latino, Asian, etc. And gay people. Let's face it. We'd all been casually ignored by network executives through the decades. 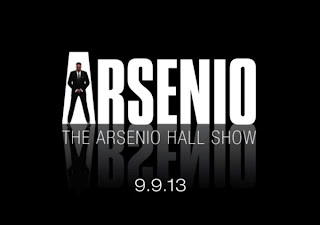 Hall returns to the late night arena next month. 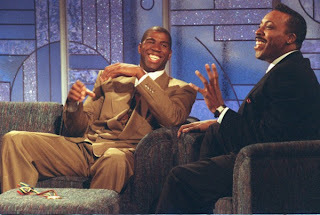 His cracking the late night color barrier made me so happy that I wanted to openly weep with joy. Before Arsenio, the only time America probably saw a black person host a late night entertainment talk show was in February 1968 when Harry Belafonte substituted for vacationing Johnny Carson one week on the Tonight show. During that week, after opposition from NBC brass, Belafonte booked Dr. Martin Luther King as a guest. Belafonte's week as guest host was so racially significant that my parents urged me to stay up late to see some of it. I was a high school student then. Martin Luther King was slain two months later. 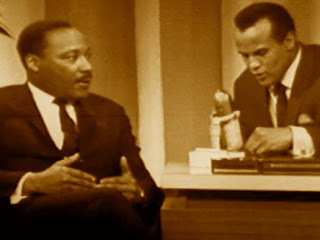 I got the story on Belafonte battling NBC brass to book Dr. King from Charles "Chiz" Schultz when I was a 1991 guest host on CNBC's Talk Live. I asked him to be my guest. What a cool guy! Chiz was a producer of the Oscar nominee for Best Picture of 1984, A Soldier's Story starring Howard Rollins and Denzel Washington. Before that, he produced The Angel Levine, a 1970 film starring Harry Belafonte as an angel to shows up to help a hopeless Jewish tailor played by Zero Mostel. 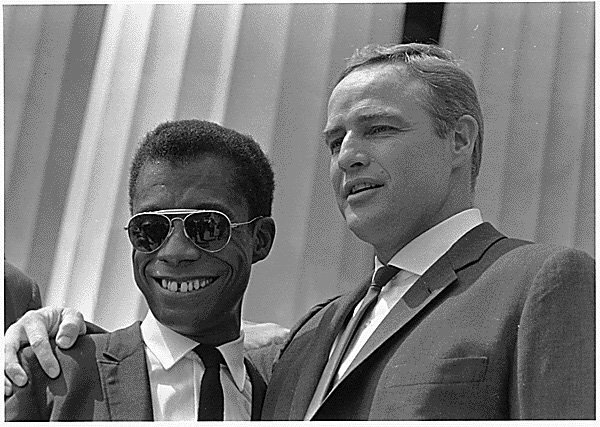 Chiz and Belafonte became friends in 1968 when Chiz was on the Tonight show production team in New York City. He worked with Harry that week on NBC. 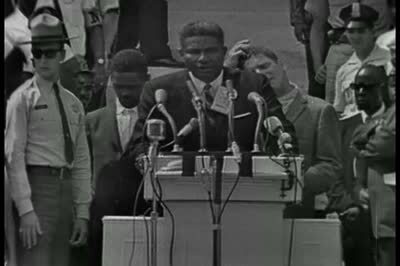 In the interview, Chiz revealed that network executives saw Dr. King as too radical and felt his appearance would mean a loss of sponsors. Tonight didn't lose any sponsors. As I wrote on Twitter, the lack of color in this chapter of TV history is a story in itself. I'd love to hear Bianculli give us some reports on that one day. If you've missed "Late Night Week" on Fresh Air, visit the program's page on npr.org. P.S. It's Friday. I listened to the final one-hour installment of the "Late Night" salute. Arsenio Hall did not get mentioned at all in the entire series. Chevy Chase got mentioned. He didn't. As the host used to say on his late night Fox show, "Hmmmmm." Color. TV. The March on Washington. 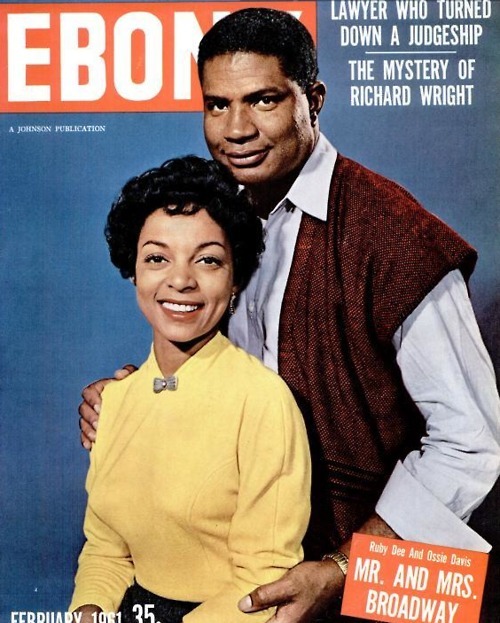 Ruby Dee and the late Ossie Davis were like a Hume Cronyn and Jessica Tandy for the black American community. The acted on Broadway. He was a Broadway playwright. They acted together in films. They did television. Ruby is still working. Millions remember them in Spike Lee's 1989 classic, Do the Right Thing. 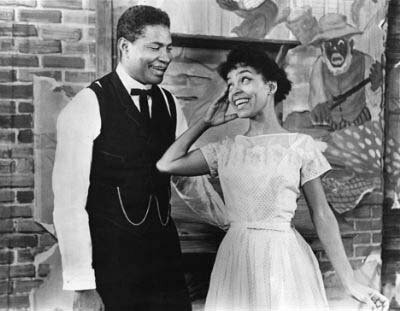 Ruby originated the role of Ruth Younger opposite Sidney Poitier in Lorraine Hansberry's groundbreaking 1959 play, A Raisin in the Sun. She and Poitier recreated their roles in the 1961 film version of the Broadway hit. 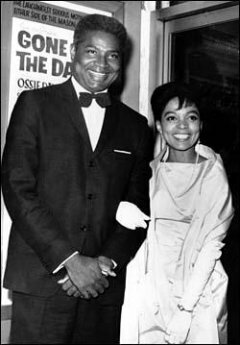 Mr. and Mrs. Ossie Davis acted together onstage in the satirical down South comedy, Gone Are the Days!, also known as Purlie Victorious. 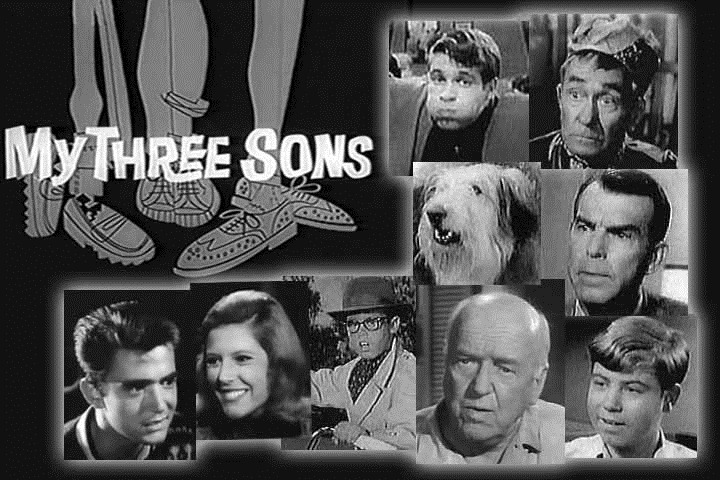 The original cast included two new actors who'd become stars. 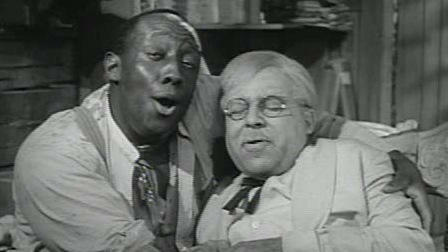 Kneeling is comedian Godfrey Cambridge. Standing in the back with a fake black eye is Alan Alda. Standing in between Ossie and Ruby is future Nobel Peace Prize recipient, Dr. Martin Luther King Jr.
Ossie Davis wrote the play. 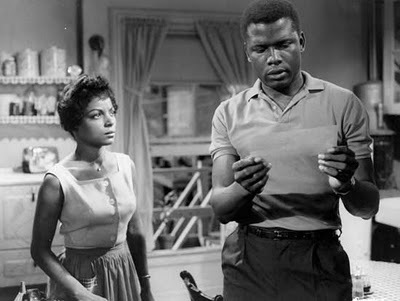 Original cast members repeated their roles in the 1963 film version, Gone Are the Days!, with a screenplay by Ossie Davis. 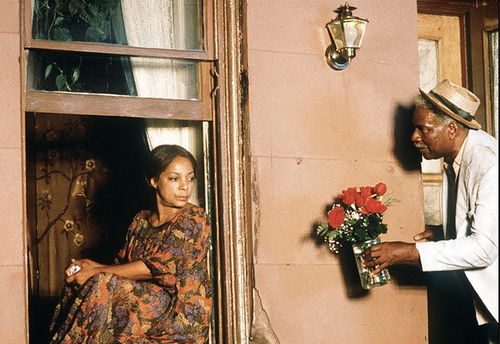 This civil rights era comedy movie is ripe for re-appreciation today. Davis wrote a winner. Davis went on to co-write the book for the hit Broadway musical version of his play. 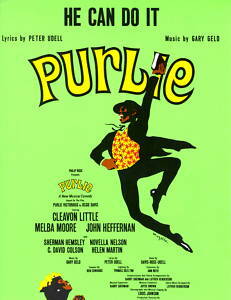 It was entitled Purlie and it made a star of its leading lady, Melba Moore. 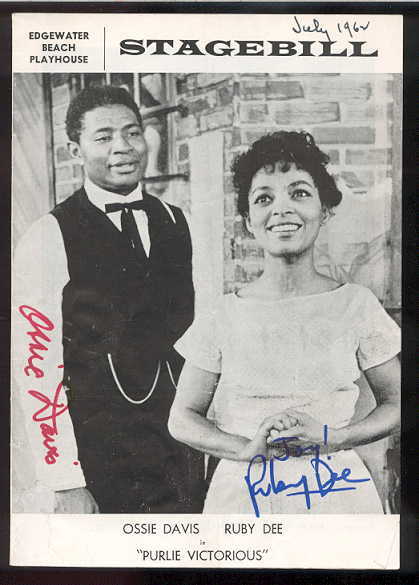 Ossie Davis and Ruby Dee -- man, what an extensive and golden list of credits on their resumés! They worked with greats in the fine arts. He directed films after working with famous directors such as Sidney Lumet. 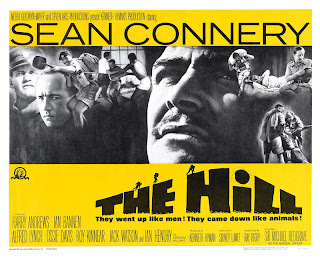 For Lumet, he made The Hill starring Sean Connery. 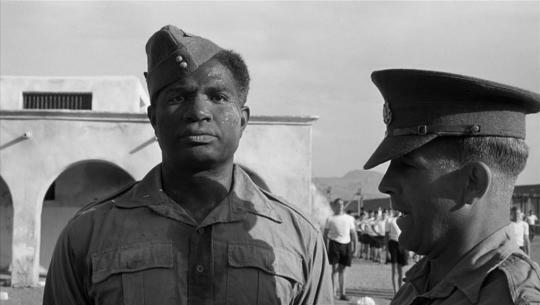 This men-in-wartime drama set in a British army prison is one of Lumet's best. 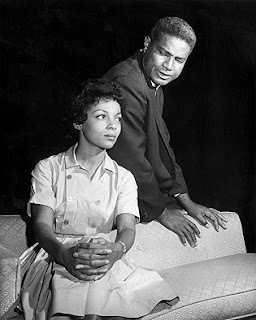 As a Catholic kid growing up in South Central L.A. in the 1960s and attending parochial schools where black priests were also my schoolteachers in classrooms with lots of other black Catholic kids, it made my parents and me proud to see Ossie Davis play a Catholic priest in 1963's The Cardinal directed by Otto Preminger. We felt represented. We felt recognized. 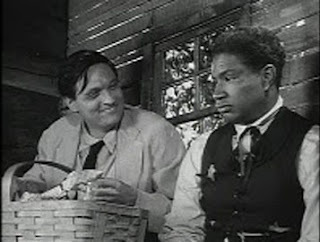 Tom Tryon starred in the film. 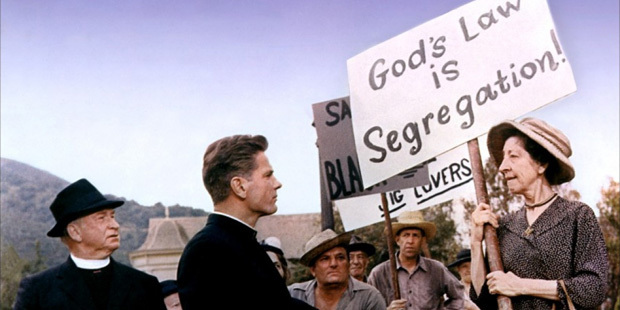 Even looking at today's film and TV images, one wouldn't know that we black Catholics exist in this country. 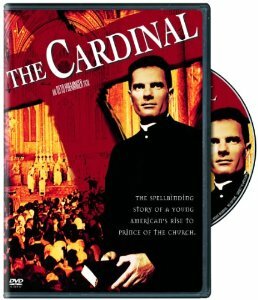 Ossie's priest character helps the future cardinal who takes a stand against racial bigotry. Ruby Dee and Ossie Davis were also passionate and peaceful activists. 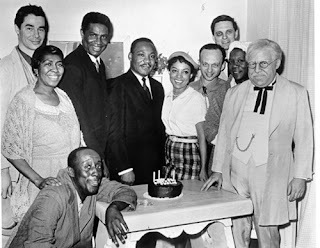 They were friends of Dr. Martin Luther King. 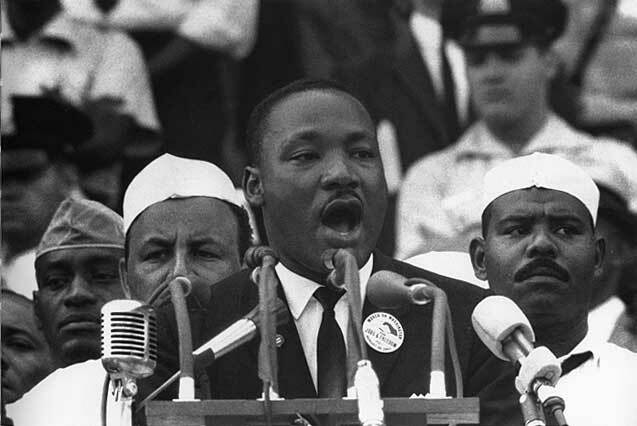 They were with him when he made the now-historic "I have a dream" speech at the March on Washington. 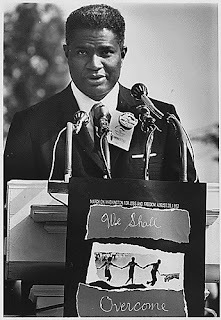 Ossie was an emcee before Dr. King spoke. Ruby also addressed the crowd. Then Martin made history. 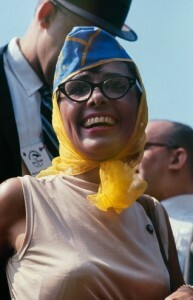 ...and legendary singer/actress and activist Lena Horne. Keep that history in mind. 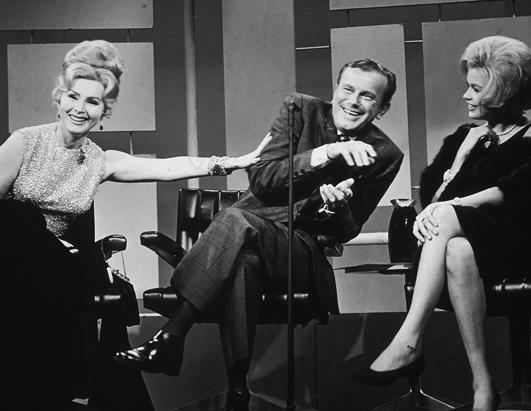 When I was a little boy this day in 1963, millions of us American television viewers -- especially those of us in the black community -- talked with pride and gratitude about the celebrities in that network TV special live telecast. Millions watched these celebrities speak and perform in the March on Washington. Of course, we also talked about the magnificent Dr. King. This week, millions watched and talked about Miley Cyrus on MTV. Times have changed. But, occasionally, it feels like they haven't. That was the case for me in 1993 and '94. I was a regular on a weekend morning news program on a network affiliate in New York City. I was approached to be on the show and it came to me after my years on VH1. I had my own prime time celebrity talk show on VH1. 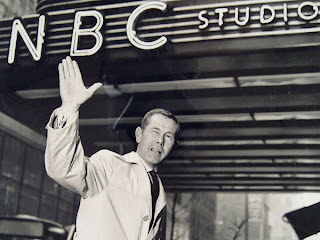 Unfortunately, once I accepted the offer to be on the news program, I had less freedom in that particular world of broadcast journalism than I did in the world of entertainment on a musical channel. I was stunned at the number of producers I worked for who'd never read my resumé and assumed I'd never covered entertainment on TV. One newsroom employee said aloud in a staff meeting for our show, "I thought you were an intern." It pains me to report that all these people were white staffers. Friction occurred. 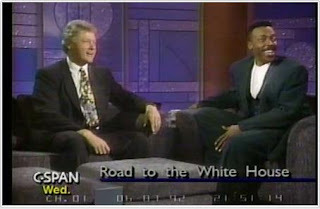 A memorable moment for me happened in the late 1980s when I was on assignment for VH1. I was leaving a hotel in West Hollywood to go shoot interviews for our show when I saw a show biz icon coming into the hotel. Seeing Ruby Dee in person was, for me, like seeing show business royalty. I was humbled and honored when she took my hands, smiled broadly, and said, "I've seen you!" When I finished my TV shoot that day, I went back to the hotel and called my mother. I had to tell her about meeting Ms. Dee. Many of the fine publicists who helped my career by giving me excellent guests for my VH1 talk show followed me over to the weekend local news program that premiered in September 1992. The lack of awareness or disregard for my previous credits showed in assignments I was given. Or not given. "I don't think you have the skills" was the immediate comment from the show's producer when I wanted to do film reviews. 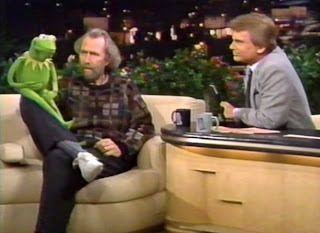 "They're not our audience" was what I heard several times when I was offered guests to interview in the studio on the show. That meant the celebrities wouldn't be of interest to our show's viewers. I was assigned live remotes at local community events, like street fairs, and was expected to be funny doing them. 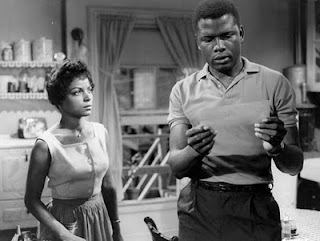 One day, a publicist offered me the opportunity to have two people in the studio live for a weekend interview -- Ruby Dee and Ossie Davis. Wow. Yes! I wanted that interview! I had to turn it down. "They're not our audience" is what the producer once again said. I reminded our news program producer that this noted stage and screen couple was with Dr. King at the March on Washington. It didn't matter. I grew to hate those words "...not our audience." They denied me the chance to interview not only Ruby Dee and Ossie Davis, but also to have in-studio time with actress Pam Grier, singer Dianne Reeves and singer Patti LaBelle. The co-anchor of the show asked if he could book a celebrity guest. That same producer gave him the "OK" for a live interview segment...with Pia Zadora. 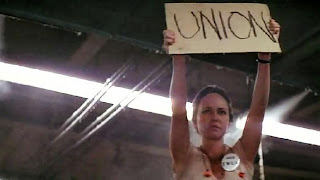 The March on Washington was overcome by the Golden Globe winner for New Star of the Year in 1982's Butterfly. Ever heard of it? What really irritated me and made me want to grind my molars into dust was our producer nixing my opportunities to interview black, Latino and gay artists live in the studio for most of the year. However, come mid-January, she'd smile and ask me if I could come up with entertainment segments on African-American artists for February. Why? Because February is Black History Month. 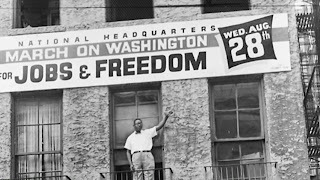 It made me wonder if some Americans had really gotten the message of the March on Washington. It's why diversity in television and in other areas of the arts is so important to me. I quit that hit show in January 1995. I did not have equal opportunities working there at that time. I'm positive the situation would be different now. Back then, diversity needed a wider embrace. It still needs to be embraced today but progress has definitely been made. 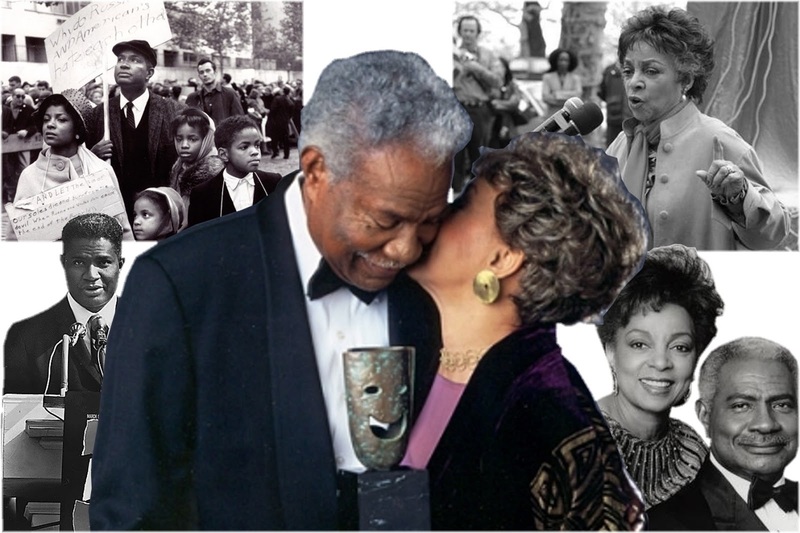 In 1995, Ruby Dee and Ossie Davis were each awarded the National Medal of the Arts in a White House ceremony. Obviously, they were somebody's audience. 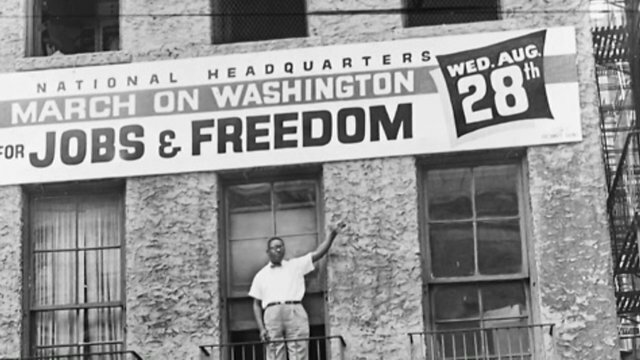 Today, let's remember and re-commit to the message of the March on Washington. And check out some of fine work I mentioned here starring Ossie Davis and Ruby Dee. "...make civil right from civil wrongs..." ~Ossie Davis as preacher Purlie Victorious in the movie Gone Are the Days!